Machar returned to government as vice-president in April 2016 after a power sharing deal, but fighting between the rival sides erupted in Juba just three months later with Machar fleeing into exile where he has remained ever since. 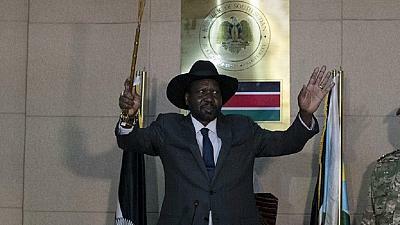 "I call on everyone as a leader of South Sudan that this agreement which we have signed today should be the end of the war and the conflict in our country", said President Salva Kiir. Sudan's President Omar al-Bashir attended the signing ceremony in Sudan's capital, Khartoum. "In initials, an agreement on outstanding issues has been signed and this agreement expresses the commitment of all parties to a ceasefire", Foreign Minister Al Dirdiri Mohamed said on Sudan state television. South Sudan became independent from Sudan in 2011, but civil war broke out two years later between the government led by Kiir and a rebel movement led by former vice president Riek Machar. But Sudan's Bashir said the mediators were committed to ensure that the agreement was implemented. The Khartoum peace talks are seen as the last chance at bringing peace to South Sudan. "I would urge. IGAD to focus after this on the implementation of the agreement", Machar said in his address.